‘Tis the season to eat now, worry later – or not. 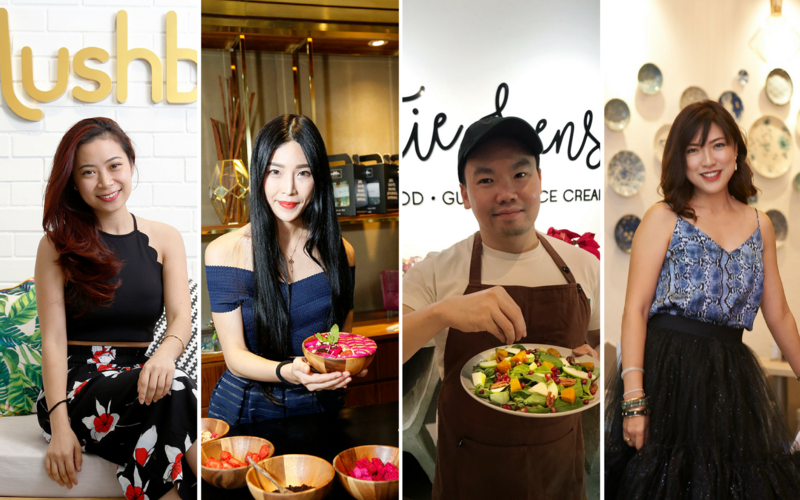 For the founders of KL’s 4 hottest healthy foodie spots, the holiday season couldn’t be a better time for healthy, festive menus to shine. With a focus on flavourful profiles, heaps of texture, and colourful plating, let the owners of your favourite healthy cafés show you what they’ll be whipping up for their party table this Christmas and New Year. "Cook: Suggest a potluck party and cook something roasted, grilled or baked. Best to have at least 50% ratio of fruits and vegetables on your platter. If eating out, choose restaurants that serve healthier options. Sweet alternatives: Control intake of sweets, desserts – if possible, make healthy sweets with better quality ingredients, no refined sugar, non-processed, natural. Activity: Spare 10-20 minutes of your day to do a quick work out. I usually search on YouTube for a 10-minute intense work out before shower time." Add rolled oats, dried cranberries and medjool dates in a food processor and blend for 1 minute, until yields a dough-like consistency. Toast your oats and almonds in the oven for 10-15minutes until slightly golden brown. Warm honey, ginger, cinnamon and nutmeg powder in a small saucepan over low heat. Stir and pour over the oat mixture and mix. Make sure the dates and dried cranberries are evenly distributed. Line a plastic wrap or parchment paper in a 8x8 inch baking dish and transfer the mix. Press down evenly, using anything with a flat surface (or glass drinking cup). Cover the baking dish with cling film and let it firm up in the freezer for 15-20 minutes or refrigerator for 2 hours. Cut the block of granola according to any sizes preferred. Enjoy! "We believe that it is never too late to start eating healthy and getting fit. Even more so now as we jump into the beginning of a brand new year, brand new you! The Good Co. has launched some yummy and healthy goodies for Christmas: The Grinch Bowl, Gluten Free Machos Nachos, Ginger Man Granolas, Sweet Potato Latte and High Quality Hot Chocolate. In 2018, we will be revamping the menu and launching a range of hot food which includes a variety of healthy grains and noodles to accustom to Malaysian preference. Stay tuned!" Question the menu. Ask the restaurant how the dishes are prepared so that you can make informed decisions when ordering your meal. Portion. If you can't pass up that slice of cake, have a smaller slice. Smart substitutions. If you wish to satisfy that craving, opt for a small square of dark chocolate, that’s rich in antioxidants and lower in sugar and fat. Cap alcohol. Alcohol has 7 calories per gram and is metabolised ahead of carbs, proteins & fats. This means that you’re not going to burn calories from carbs, proteins & fats until your alcohol calories are spent. We'll still enjoy a tipple, minus the binge drinking. Stay active. The holiday season can be busy and exhausting, and one of the ways to fix re-energise is by exercising. Don't skip your regular exercise routine - even if you only have 30 minutes, maximise it. With a bit of discipline, I get my workout done and dusted before heading out to yet another festive dinner!" Lay a bed of your favourite salad leaves on a plate. We used rocket, romaine lettuce and watercress. In a mixing bowl, combine until dressing thickens. Season with salt and pepper to taste. How Fittie Sense is keeping up its fit philosophy through the merry season. "Our first Christmas at Fittie Sense will be special. Our Christmas centrepiece of choice is the majestic capon: Plumper than a chicken and more flavoursome than a turkey, we source ours from an organic, free-range farm in Penang. We preserve its meaty, tender and moist quality by roasting it simply with herbs, citrus and butter, served alongside Brussel sprouts, glazed carrots and roast potatoes." "The holiday season comes once a year and I totally embrace the festivities as I meet family and friends over delicious meals. It’s hard to resist anything when you spend time with loved ones. Don’t deprive yourself. Take small portions of what you want to try. Stay active. Do something fun, like going outdoors with the kids or invite your family/friends to try new things like hot yoga or spin classes. Travel to explore new discoveries. Make staying active part of your holiday agenda. It can be somewhere close by – like a trail walk at FRIM or Bukit Kiara. Incorporate natural food. Knowing that I will succumb to indulgence, I make it a point to have The Defender daily, a natural shot of turmeric and gingerwith anti-inflammatory and fat burning properties to push out unwanted waste!" "Avocados are perfect for any occasion. Whether it’s whipping up a hearty avocado-egg toast or even as dip for parties, avocados are the best bet for a healthy treat. What you will need: ripe avocados, good quality sea salt (I like Maldon Sea Salt flakes), freshly ground black pepper, a squeeze of fresh lemon juice, extra virgin olive oil. Mash and season, then garnish to a spreadable consistency. Enjoy as breakfast avocado toast, party avocado crostini, or guacamole dip." "La Juiceria will launch a Holiday Edition of Love W – a red cold-pressed juice favourite, enhanced with chia seeds. Chia seeds help repress hunger, quiet cravings, improve digestionsupply energy, balance blood sugar, and help restore omega-3 balance. This will be made available just before Christmas day and will last all the way to Chinese New Year; as an auspicious and healthy symbol that’s traditional too." "The festive season is the most indulgent time with many parties to attend, so just celebrate, have fun and treat yourself to a little bit of everything! Keep them all in moderation. Try to put aside some time everyday for a quick workout and remember the best time to eat is during the golden hour after. Don't forget to warm up and stretch!" Stir fry until cauliflower is at desired texture. Season to taste. Enjoy!" "Lushbowl is known to go a little over the top with decorations! This month, it's been all about giving back. We're gifting all our ‘Lushies’ a mini Christmas pack of our handmade granola until December 31 in conjunction with other exciting giveaways! We’ve got an upcoming big Christmas giveaway with Shiseido on Instagram. We managed to source the best cranberries from the US, which star in our Lush Christmas menu!"